Do you want to know what game modes will be available for which systems? Below is a summary of each game mode in NBA 2K15. We've broken these modes down into sections, divided between single player and multi-player modes. Additionally, there's a handy table at the bottom of this post that shows which platforms will have what modes available. Create a custom player and guide him through through the NBA, from being a promising rookie to a superstar player. During their career, players court sponsors and use social media to grow their following via social media. After building your MyPLAYER on the court during your MyCAREER, you will be able to take him online to compete on the Park. The other side of basketball, this allows players to assume the role of General Manager and run everything behind the scenes. Everything, from contract negotiations to food prices in the stadium, are in your hands. Another behind-the-scenes mode, MyLEAGUE lets you experience what it is to run a NBA franchise. In this mode, nearly everything is customizable in your hands from things like salary caps, team roster, and even season lengths are up to you. Franchise management mode for the previous generation of consoles (PS3, Xbox 360). The Association lets you assemble a team, follow player trends, and sign free agents in order to create the best lineup possible. 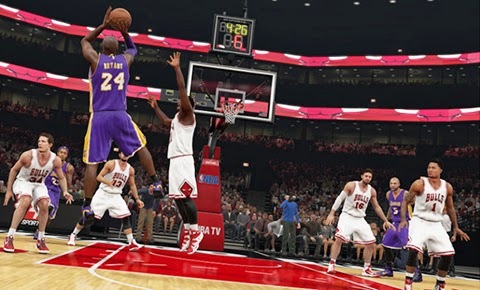 Created for the previous generation of consoles (PS3, Xbox 360), 2K Heroes will allow users to compete as some of the best teams in the NBA, headed by some of the most famous players. The team with the most wins on record during (announced time frame) will have that player’s charity receive a donation from 2K. Each NBA player/legend will select their unique teams to compete with of their choice. Public Associations – First-come, first-serve leagues that vary in quarter length, difficulty speed of advancement, games per season, and whether or not there is a fantasy draft at the start of the league. Private Associations – One player acts as commissioner to set up an association with custom options and rules; other players join the association. Online leagues return to NBA 2K15 where you can friends can take over control of your favorite teams and compete online against other users. This is NBA 2K15’s collectible card game-within-a-game. You buy virtual packs of cards containing players, coaches, uniforms, and more in order to build an unbeatable team. Offering both offline and online game modes within MyTEAM, you can go head-to-head with other players or complete challenges and tournaments. Unwanted cards can be auctioned off to other players at the brand new Auction House. Accessible from MyCAREER Mode, MyPARK lets you take your MyPLAYER character online and join one of three MyPARK communities: Rivet City, Old Town and Sunset Beach. Each community has their own special ability boost. Additionally, joining a community will allow you to compete against other communities on Rival days where you can earn special perks like earning a 25% VC bump. Within these parks, you can play with others in 2-on-2, 3-on-3, or 5-on-5 games. This year, we allow users to “squad up” to play with other friends as well as introduce teammate grades to the park that allow you to be graded on your performance, and rank up through our new rep system. Park games will reflect a street-ball style of basketball with games going to 16 this year. When you’re traveling through the various Parks, you can enter the “Rec Hall” where users can compete in 4-quarter, NBA simulation games with referees and NBA rules in the most competitive 5-on-5 games with your MyPLAYERs. You can also squad up here, claiming your stake as a squad and hold down the court against other users. This will take place in an indoor Jordan-brand gym. When you’re feeling competitive, enter the Stage from the MyCAREER menu and ante up against others online in VC wager matches. In this mode, you can take your MyPLAYER character and form a Crew (complete with custom jersey and logo), which you can use to play a variety of street basketball games against other players. This mode allows you to unlock playable NBA stars in exchange for Virtual Currency. WHAT MODES ARE ON WHAT SYSTEMS?